While Cadet 4th Class Alexander H Wise of Squadron 19 was home on break, he stopped by his old stomping grounds Euless Trinity High School to work out in their training facility when his former football coaches saw him. 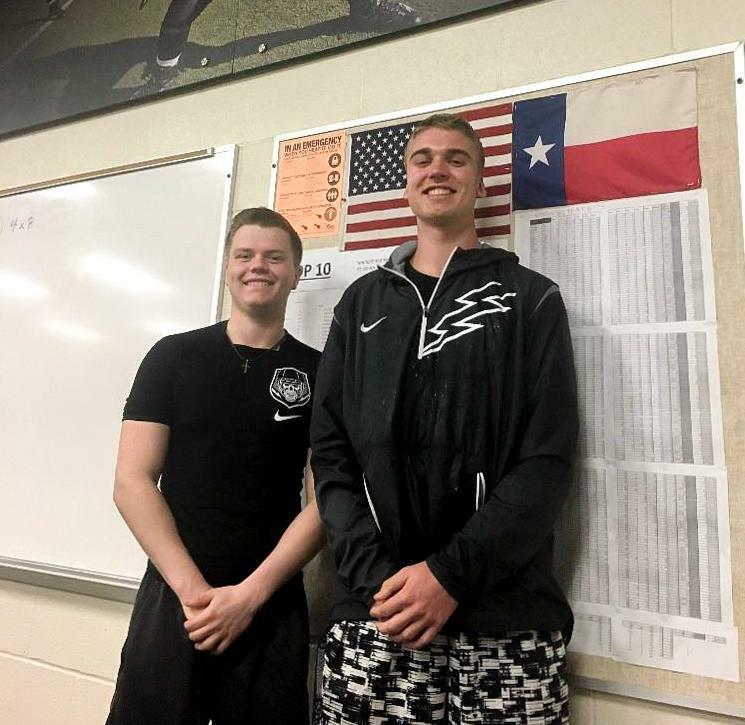 Through conversation, they asked if Alexander could meet with Brice Honaker, a current student at Euless Trinity High School who has accepted a football scholarship to USAFA with the incoming Class of 2022; of course Alexander agreed. Brice had many questions about what to expect and Alexander provided pointers how to prepare before in-processing and some ways to help make the experience of Basic Cadet Training a positive one. Dr. David Wise, C4C Alexander Wise's father also had Alexander forward the information about Write2Them.org so the parents understand a good way of communicating with Brice once he reaches the Academy. Fun Fact: They've both played on the nationally ranked Euless Trinity Football Team. C4C Wise plans to stay in touch with Brice during his transition to the USAFA. "One thing I am impressed with about the USAFA, everyone forms a bond of friendship and makes it feel like family each time I see Cadets interact with one another. This really helps knowing many of the Cadets are not fortunate to always have the opportunity to go home and be with family frequently. The Cadets to each other are Family!"